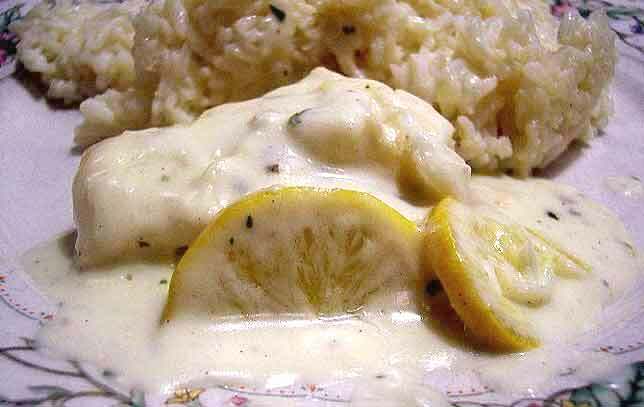 4 boneless chicken breasts cut in half and weighing about 6 ounces each. Slice shiitake mushrooms and sauté in olive oil along with minced garlic and chopped parsley. Add salt and pepper to taste and cook till mushrooms are tender. Remove from heat. 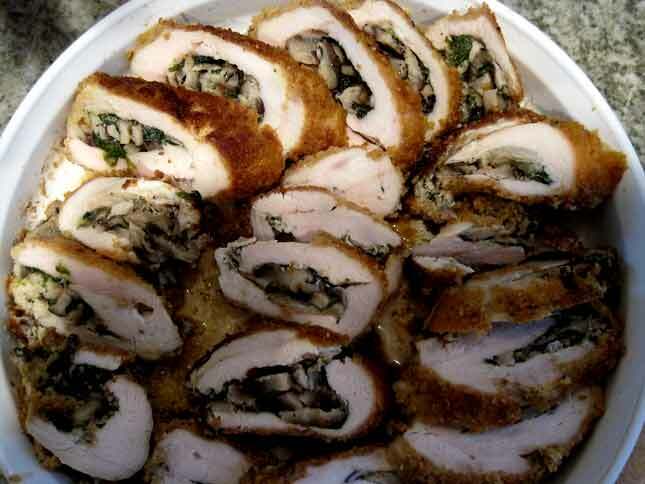 Fill each flattened chicken breast with some of the mixture and roll up. Dip in beaten egg and then seasoned bread crumbs. Return to hot frying pan to which you have added some extra olive oil. Fry till golden on both sides. Place frying pan in a 350 degree oven for about 20 minutes till chicken is cooked through. Slice on the diagonal and serve.. I made it last evening, motzey Shabbos, since I had some friends over; we all thought it was very good. Thank you Irene for this delectable recipe!!! For side dishes I made some mashed potato with margarine, minced garlic, basil (for a great aroma), and a dash of tarragon; the second side dish was a simple honey-dijon salad. We paired it with a Benyamina 2007 Chardonnay, a very nice combination. Thank you Irene, for this delectable recipe!!! You’ll find more photos on Irene’s blog, giving quite a detailed visual description. 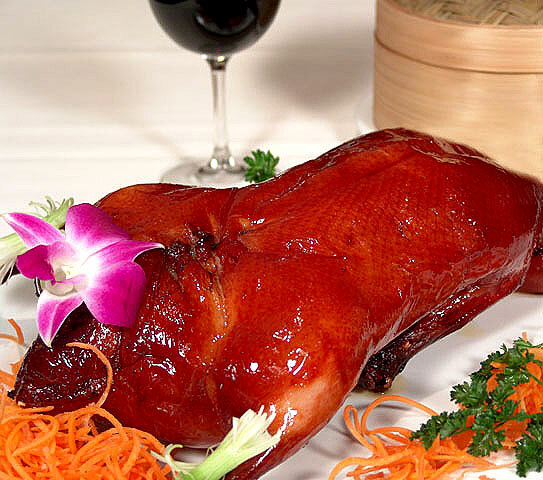 Whenever I pass by a Chinese restaurant, my gaze invariably turns to those very shiny, brown colored, ducks that often are displayed so as to be seen from the outside. They look delectable but, alas, they are not kosher… I finally found what promises to be perfect directions for a delicious kosher Peking Duck on the Chef Kosher website. 1. Rinse the duck inside and out, and pat dry. Cut off tail and discard. 2. Mix together the cinnamon, ginger, nutmeg, white pepper and cloves. Sprinkle one teaspoon of the mixture into the duck. Stir one tablespoon of the soy sauce into the remaining spice mixture and rub over the entire outside of the duck. Cut one of the green onions in half and place inside duck. Cover and refrigerate for at least 2 hours. 3. Place duck breast side up on a rack in a big enough wok or pot and steam for an hour adding a little more water, if necessary, as it evaporates. Lift duck with two large spoons, and drain juices and green onion. 4. Mix the remaining 2 tablespoons of soy sauce and honey. 5. Preheat the oven to 375F. Place duck breast side up in a roasting pan and prick skin all over with a fork. Roast for 30 minutes. 6. Brush the honey mixture onto the duck and return it to the oven. Turn the heat up to 500F. Roast until skin is richly browned. 7. Prepare duck sauce by mixing plum jam with the sugar, vinegar and chutney in a small serving bowl. Chop remaining green onions and place them into a separate bowl. Place whole duck onto a serving platter and garnish with orange slices and fresh parsley. Use plum sauce and onions for dipping. The more I reread the above recipe, the better it tastes in my mind… I think if I start preparing it now I could still enjoy for Shabbat, tonight. Hmnnn, that might make this Shabbat Rosh Chodesh, especially memorable!